Shulz, H.; Fonollosa, José A. R.
Intrinsic variability of the speaker in spontaneous speech remains a challenge to state of the art Automatic speech recognition (ASR). While planned speech exhibits a moderate variability, the significant variability of spontaneous speech is caused by situation, context, intention, emotion and listeners. This conditioning of speech is observable in terms of speaking rate and in feature space. We analysed broadcast news (BN) and broadcast conversational (BC) speech in terms of phoneme rate (PR) and feature space reduction (FSR), and contrasted both with the planned speech data. Strong statistically significant differences were revealed. We cluster the speech segments with respect to their degree of PR and FSR forming a set of variability classes, and induce the variability classes into the Hidden-Markov-Model (HMM) based acoustic model (AM). In recognition we follow two approaches: the first considers the variability class as context variable, the second relies on prior estimation of the variability class after the first pass of a multi-pass recognition system. Beside explicit modelling of the intrinsic speech variability of the speaker, we furthermore segregate the general speaker specific characteristics by means of speaker adaptive training (SAT) into feature space transforms using ConstrainedMaximumLikelihood Linear Regression (CMLLR), and apply the adaptive approach in third pass recognition. By approaching to model both within speaker variation and between speaker variation in spontaneous speech, we address two fundamental sources of speech variability that determine the performance of ASR systems. Intrinsic variability of the speaker in spontaneous speech remains a challenge to state of the art Automatic speech recognition (ASR). While planned speech exhibits a moderate variability, the significant variability of spontaneous speech is caused by situation, context, intention, emotion and listeners. This conditioning of speech is observable in terms of speaking rate and in feature space. We analysed broadcast news (BN) and broadcast conversational (BC) speech in terms of phoneme rate (PR) and feature space reduction (FSR), and contrasted both with the planned speech data. Strong statistically significant differences were revealed. We cluster the speech segments with respect to their degree of PR and FSR forming a set of variability classes, and induce the variability classes into the Hidden-Markov-Model (HMM) based acoustic model (AM). In recognition we follow two approaches: the first considers the variability class as context variable, the second relies on prior estimation of the variability class after the first pass of a multi-pass recognition system. Beside explicit modelling of the intrinsic speech variability of the speaker, we furthermore segregate the general speaker specific characteristics by means of speaker adaptive training (SAT) into feature space transforms using ConstrainedMaximumLikelihood Linear Regression (CMLLR), and apply the adaptive approach in third pass recognition. By approaching to model both within speaker variation and between speaker variation in spontaneous speech, we address two fundamental sources of speech variability that determine the performance of ASR systems. 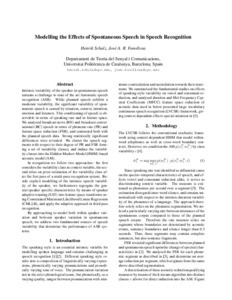 Shulz, H.; Fonollosa, José A. R. Modelling the effects of spontaneous speech in speech recognition. A: Speech Processing Conference. "2013 Speech Processing Conference: conference proceedings: July 1-2, 2013: AFEKA, Tel-Aviv Academic College of Engineering". Tel-Aviv: 2013.